This is both horrifying and cute. 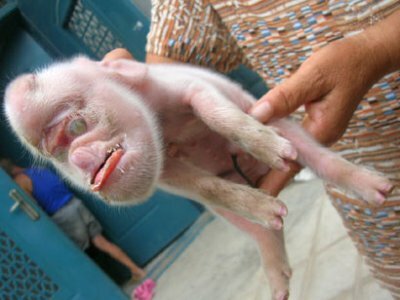 It's a pig with an abnormality that causes its face to look like that of a monkey. This thing is an abomination in the eyes of the Lord. Aw... you're so mean. I think it's adorable. WOW. that this is so gross looking it's not even funny! I think Ken is right. We need to burn this thing, and plead for forgiveness for having beheld such a sight with sanctified eyes. We'll see how cute it is when he gets all "Anung Un Rama" and invites a bunch of Cthuloids into our world! I want one. It also makes me want to eat bacon. The results of interbreeding, methinks. Some animals have a natural aversion to interbreeding, some don't. I think we can safely say that this little piggies mother was his sisters aunts first cousin too! melter65 - I doubt it. All interbreeding does is make recessive traits manifest themselves. It doesn't increase likelihood of mutation. You people saying to kill it or burn it are crazy! You people take things to seriously...why kill an innocent being for no reason? You people think you have god in your lives...HA! You NEED help! God would never want to kill an innocent being, so why do you all preach "KILL"? Who exactly are you accusing here of both wanting to "kill it" and of having "god in their lives?" Who in this thread of comments is making that statement? Also, perhaps you haven't read of God's interaction with the Amalakites. Or maybe your definition of "innocent" has no real meaning in this context. I mean... fish are innocent living beings, but I eat them. And I'm not sure what's not innocent about lettuce, but I kill it to eat it as well. he's saying killing for the sake of killing is unjust, and that's the truth. would you really want to eat that thing? but killing it just to get rid of it is criminal. just because something looks different doesnt mean it shouldnt live. Well, if you were going to kill it for any reason it'd be to put it out of it's misery. Most things that are deformed want to die so they don't have to live like that. I wouldn't want to live that way. Plus, it probably can't eat well anyway and will die slowly from malnutrition. So why prolong the suffering? leave this poor little piggy alone! its not its fault for being born like this and it should have a chance of live. Live is more important thn looks!! I think there is no reason to kill that little pig/monkey. It many not be quit but.....Do u think it can climb trees?